The following documents govern and guide the management of the ATAA. The ATAA is a not-for-profit association incorporated as a Company under the Australian Corporations Act. It is limited by guarantee and has permission to drop the word "Limited" from the association name. The Constitution, among other things, sets out the method of electing Directors to the Board. The Board is responsible to oversee the management of the Association. The current ATAA Constitution was presented to the ATAA Membership and adopted by vote at the October 2009 Annual General Meeting; it was modified slightly at the ATAA AGM in 2011. Members may browse or download the Constitution from this link below. Over time, the Board considers many matters. Some of these matters, particularly those that are reoccurring, have significant ramifications or are potentially controversial, are recorded and documented as "Board Policies". These policies are provided for the guidance of Directors, Chapter Councils and Members and provide for "continuation" as the board and chapter councils change over time. Members may browse or download the current policies from this link below. The Board issues a revised document "ATAA Chapter Management Guidelines" periodically. As circumstances change, the previous guidelines are amended, the resulting revised draft is circulated among Chapters and Chapter Councillors and a final version is agreed. The current version of the Guidelines sets out the management processes to be followed in all Chapters of the ATAA. Members may browse or download the guidelines from this link below. The ATAA holds monthly meetings in cities across Australia and welcomes presentations from speakers, either ATAA members or non-members, who are knowledgeable in the various aspects related to the financial markets. The primary focus of the ATAA is technical analysis; however, we are also keen to hear presentations on other topics related to trading and investing, such as strategies, money management, market psychology and trading psychology. Speakers are requested to provide a copy of their presentation for subsequent inclusion on the ATAA website. The presentation will be made available in the ATAA Contribution Library to ATAA members and (occasionally) website registered visitors. The speaker profile and the abstract of the presentation will always be available to the public. If additional information is required, direct your enquiry to the ATAA Director in charge at: . Anyone may browse or download the ATAA Speaker Guidelines from this link below. The ATAA welcomes submissions of articles for inclusion on the ATAA website from both ATAA members and non-members. Our members and website visitors trade and invest in all financial markets, including shares, ETFs, CFDs, options, futures and forex. 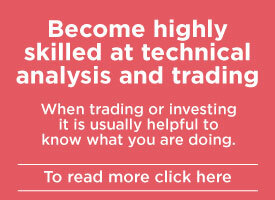 Articles which introduce new technical analysis-based trading and investing concepts will be most highly regarded. However, we also publish articles on other subjects related to trading and investing, such as strategies, risk management, market psychology and trading psychology. All articles are subject to editor consideration and all are reviewed from the point of view of both logic and clarity. The accepted article will be made available in the ATAA Contribution Library to ATAA members and (occasionally) website registered visitors. The author profile and the abstract of the article will always be available to the public. Anyone may browse or download the ATAA Author Guidelines from the link below. The ATAA is a not-for-profit, member-run association that aims to provide financial market education, meetings and opportunities for networking to our members. 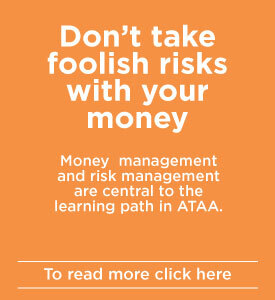 The ATAA NEVER provides any financial advice. The ATAA is independent of any provider of goods or services and always maintains this independence. The ATAA Disclaimer is shown at all ATAA meetings. This disclaimer was prepared by the ATAA legal advisor in December 2009; it must not be amended other than by our legal advisor. Anyone may browse or download the ATAA Disclaimer from the link below. The ATAA Corporate Profile has been prepared to answer the question "Who or what is the ATAA?". It is designed to be sent to potential sponsors, conference exhibitors, suppliers who offer discounts to members etc. Anyone may browse or download the ATAA Corporate Profile from the link below.